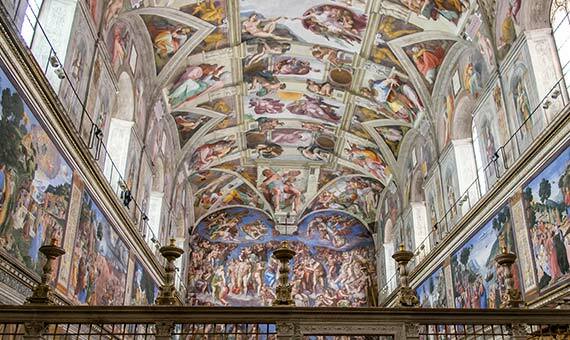 Start The Sistine Chapel, a Hidden Treatise on Human Anatomy? Few people have the privilege of being known to history by their first name. This is an honour reserved only for the very greatest of figures, such as Michelangelo di Lodovico Buonarroti Simoni, known simply as Michelangelo. The artist born in the Republic of Florence on March 6, 1475 has bequeathed to humanity some of the most admired works in the history of art, such as the frescoes of the Sistine Chapel or the sculpture David. His work is famous for its anatomical fidelity, but a lesser-known fact is the source of this knowledge: Michelangelo carried out numerous dissections of corpses that, according to some researchers, inspired him to hide an entire treatise on internal anatomy in his Vatican frescoes. The facet of Michelangelo as a student of anatomy starts in his early youth in Florence. After the death in 1492 of his patron, Lorenzo de Medici, the artist carved in wood a crucified Christ for the prior of the convent of Santo Spirito, who allowed him to use a room to dissect corpses from the hospital associated with the church. According to Michelangelo’s pupil and biographer Ascanio Condivi, the artist was very pleased with these anatomical studies. Although the taboo against the dissection of the human body had softened in the Middle Ages, and Renaissance sculptors and painters were advised to attend these public operations to document them, the Florentine was one of the first artists who undertook these studies in person. Condivi described a drawing by Michelangelo that represented two men dissecting a body by the light of a candle stuck in the belly of the corpse. The artist continued performing dissections until an advanced age, when he abandoned them because they came to disgust him. 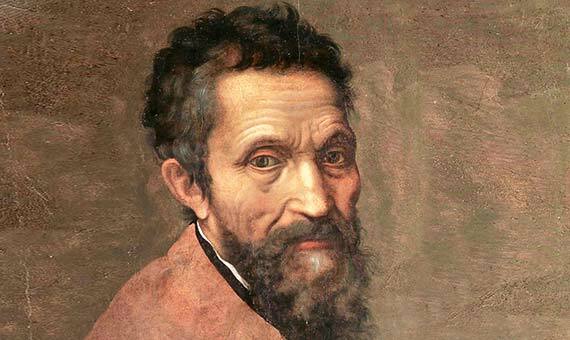 By then, Michelangelo had acquired a deep knowledge of the human body. Condivi related how he was able to teach a masterly anatomy lesson with a cadaver in his hands, revealing details that not even the doctors of the time were aware of. He even planned to publish a treatise in collaboration with the eminent anatomist Realdo Colombo, his friend, doctor and, at least on one occasion, supplier of corpses. But although his treatise on anatomy never materialized, there are those who claim that Michelangelo left numerous details of the interior of the human body represented in his decoration of the Sistine Chapel. 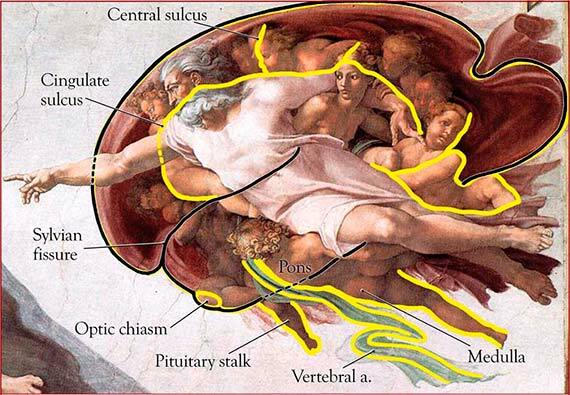 According to the American doctor Frank Lynn Meshberger, the pink mantle that surrounds God in the panel of the creation of Adam has a suspicious resemblance to the shape of a human brain, which for this author hides a message encoded by Michelangelo: the gift of intelligence granted by the creator. In 2000, the nephrologist Garabed Eknoyan published a study in which he established a similarity in structure and colour between the mantle of God in the fresco of the separation of the land from the water, and a dissected right kidney. Eknoyan not only related this apparent similarity to the kidney problems suffered by the artist himself, but also interpreted this representation as a deliberate metaphor for renal function in the separation of solids and liquids, as it was then understood. For their part, the Swedish doctors Lennart and Anne-Greth Bondeson maintain that the God embodied in another panel, the separation of light from darkness, shows in his neck and throat clear signs of goitre, a thyroid disease that the artist himself may have suffered from. The Bondesons suggest that through such representation Michelangelo wished to confer divine status upon himself. But curiously, this same neck with its strange, lumpy appearance and incoherent lighting has for neurosurgeon Rafael Tamargo and medical illustrator Ian Suk another very different meaning: for them it is an outline of the human brain stem, which is accompanied by a spinal cord and an optic nerve in the folds of the garments. The speculations do not end here: some have seen a shoulder joint drawn on the body of a sibyl, a vertebra in the image of Holofernes, the hyoid bone in the posture of God separating the light from the darkness, a lung in the shape of the mantle of God creating Eve… It has become a veritable “Michelangelo code” in which various researchers have wanted to see the Sistine Chapel as an undercover treatise on human anatomy, but whose veracity will likely never be proven with a shred of evidence.